I met Michael Costello back in February 2014 at Poet's House in New York City at the launch reading for The Incredible Sestina Anthology. 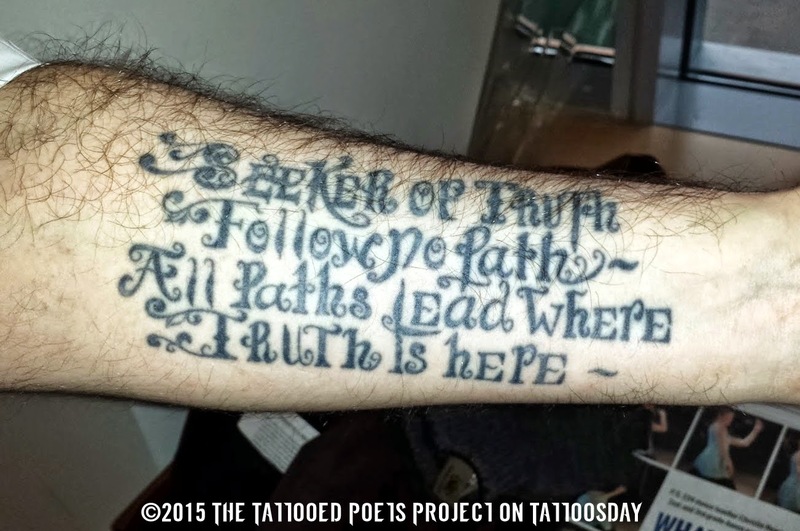 I spotted his tattoo in the lobby after the reading, we got to talking, and here we are, a year later, with the penultimate post for the 2015 Tattooed Poets Project. This is a complete poem by e.e. cummings: "seeker of truth//follow no path/all paths lead where//truth is here." "I spent years marred by ambivalence about what to get inked. How does one ultimately decide? As a child, 5 years old or so, all the way through to my college years, I remember my mother would recite various poetic fragments. Often it was something by e.e. cummings. These recitations became part of my internal dialogue, part of who I am. This one, above all, resonated with me. I had the tattoo done when I was 31 or so. I worked with a tattoo artist in Saratoga Springs, NY. This was 6 or 7 years ago. I remember his name was Matt. Instead of using cummings' distinctive lower case typewriter font, I wanted to choose something that captured the essence of the poem. Serendipitously, Matt was working on an original font. And that's what this is." that's kept him hangin' on. could make a song out of the obituary section. or just get trampled on?" that life only ends when you die?" singin’ his name out, like a siren. Michael Costello was born in Buffalo in 1976 and holds an MFA in Creative Writing from The New School. Since then he has published in numerous print and online journals, including The Del Sol Review, MiPo, eye-rhyme, The Columbia Poetry Review, La Petite Zine, Tarpaulin Sky, and Essays & Fictions; he was also included in The Best American Poetry 2004, and in The Incredible Sestina Anthology. Currently, Michael lives and works in Cambridge, MA. Clicking the links in the bio above will magically transport you to more of Michael's poetry. Thanks to Michael Costello for sharing his tattoo and poems with us here on Tattoosday's Tattooed Poets Project! This entry is ©2015 Tattoosday. The poems and tattoo are reprinted with the poet's permission.